We discuss a lot of nothing. Brian decides to contribute in the least conventional of ways, Gianni learns Nutrition, and we poke fun at each other for 35 minutes as Gianni literally holds a backscratcher. Should Beasley be in the starting lineup? Could the Heat bench clinch a playoff seed in the East? And why is Ray Allen doing everything else but shooting the ball? 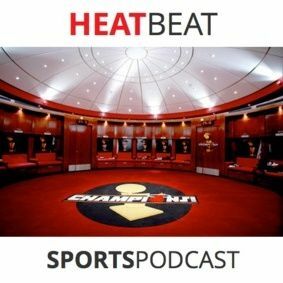 All that on this edition of The Heat Beat. We go "Around The League" as we breakdown The Knicks playing for Mike ... See More Woodson's family, Portland Trailblazers win over the Indiana Pacers, and the Sacremento Kings refusing to interact with winners...don't ask. And we unveil a new game, "Things You Could Do Without!" Admittedly, not our best show. We'll have a team meeting and play better next game, coach. We promise.